Sunday, 7th July saw Sensei Cummins, 8th Dan, accompanied by Sensei Austin Birks, 4th Dan attend Ippon Ken Karate Club's Kyu and Dan gradings. Sensei Cummins split the class into two groups - black and brown belts were given an hour of very intensive, hard style Shotokan training, typical of Sensei Enoeda's JKA sessions, with the emphasis on speed, agility and dynamic explosive power. Short, sharp drills were the order of the day as the students put heart and soul into executing the techniques. Sensei Cummins then focussed on Kihon Kata, with the emphasis on good form and sharp technique. He then went through Heian Godan and explained the bunkai in detail to the students. 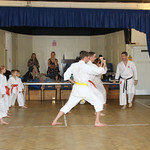 He then challenged the students by making them do parts of the kata in the opposite direction ("ura"). This proved a lot more difficult than it might appear. Following the course, Sensei then conducted Kyu gradings before moving on to the black belt gradings. The standard of those taking Dan grades was good, with 1 candidate passing Shodan, 4 candidates passing Nidan. After this, the dojo was vacated whilst Pete Dearden attempted his 4th Dan examination. He overcame his arduous test and was rewarded the grade of Yondan, by Sensei Cummins, 8th Dan. Congratulations to all of Sensei Kathy Dearden's students at Ippon Ken Karate Club who passed their grading!